It’s been playing in your mind, dancing there as you teach or post on Facebook or write your monthly newsletter. You have more to say, stories that want to be told, ideas that might help people. But every time you think about actually starting to write, you get confused about where or how to start. Or someone keeps telling you that you have to have a niche, but you aren’t sure which of the twelve niches you love is the right one to choose. In fact, you don’t want to choose! You want to include them all. 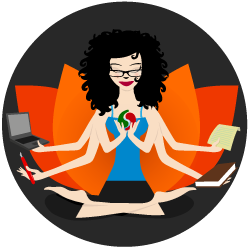 So when you do think about writing your book, you can’t ever get past trying to figure this out, so you just go to something else, something easier, like practicing Crow Pose. Or maybe you think you can’t write, so when you stare at your blinking cursor, starting feels impossible. Or maybe you have a vague belief that in order to write a book, you have to make it your job…and you already have a job! Maybe two jobs. And maybe a family. And a life. If you’re not willing to sacrifice sleep, how the heck would you ever fit it in? If any of these sound familiar, you are not alone. Every yoga teacher I have worked with — rock stars included! — has had at least one if not more of these concerns. And here’s a secret — so do most very, very established writers. It’s part of writing. If you let them, these thoughts will keep you from writing the book that only you can write, a book which could help people in deep, lasting, and fundamental ways. That’s why it’s so helpful to have a jump start. All it took is one meeting on Skype with Lori! Lori has the ability to understand and sense my energy. She has the ability to listen for the fine details and notice what is important and create what is authentic and natural. A huge thank you for her patience, listening and general warmth. What can I say other than I found the writing fairy! 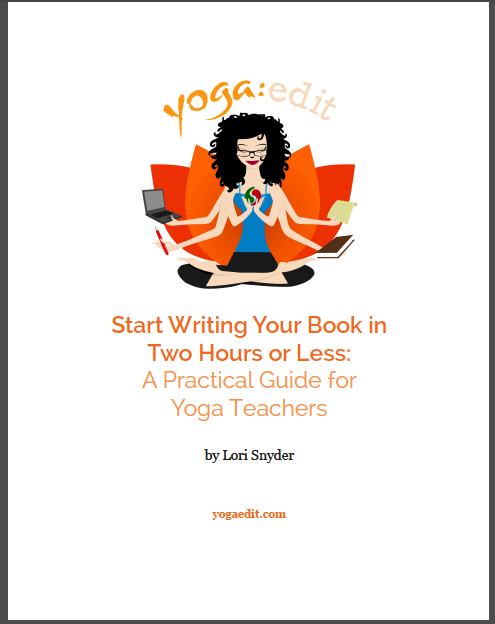 Here’s the thing: 80% of people say they want to write a book, and I suspect that percentage is even higher for yoga teachers. Only about 5% of people ever do. Why? What’s different about that 5%? It’s not that they’re smarter, or better at time management, or famous, or already brilliant writers. It’s that they made a plan for their practice and they stuck to it. And most of them had at least one teacher to guide them on the way. Imagine being able to hold your book in your hands. Your book, that you created, that shares your wisdom and stories and lifetime of practice. If you’re tired of not knowing where to begin, tired of not answering that book that is calling to you, tired of meaning to get it done but never doing it…this is for you. A book is a record of your life, your love, your beliefs, your expertise. It is meaningful, real, and tangible. Your words are needed. And I promise I will never suggest you get up half an hour earlier to write. • A 1-on-1 90-minute Skype call where you share your vision for your book and your life, and together we craft the perfect way for you to get started on your book. • A detailed and easy-to-read write-up of what we cover in the call, so all you have to do is focus on the conversation. I’ll write it all down, clean it up, and get it back to you within a day. The right plan will leave you energized and inspired, ready to jump in and write. And…I also know that sometimes, when we actually roll out our writing mat and get to the practice itself, things can sometimes get a little confusing. • Two free weeks of follow-up emails with me, to make sure you have all the support you need as you start writing your book (this usually costs $95). Often, this one-time jump start is enough to carry people through the entire first draft of their book. If this is right for you and you’re ready to start writing your book, email me to schedule (or ask questions) by clicking on the button to your right. Email Lori to Start Writing Your Book! to starting your book or teacher training manual!